I just picked this up today. It needs a wheel set and a few other parts. for good deals on the parts I need. But hey, you already got the racks ! Good score. Last edited by curbtender; 07-06-15 at 10:33 PM. Thanks for the link curbtender. past builds I just used whatever parts were on hand. Three of my five bikes have mismatched wheels. I want some appropriate and nice parts for this bike. I hope I can get it done this summer. I had one of those for a while. I seem to remember a looong top tube. Great score, the later 61X series Miyata's had the same frame geometry has the much vaulted 1000's. So you have yourself quite the tourer! Enjoy. 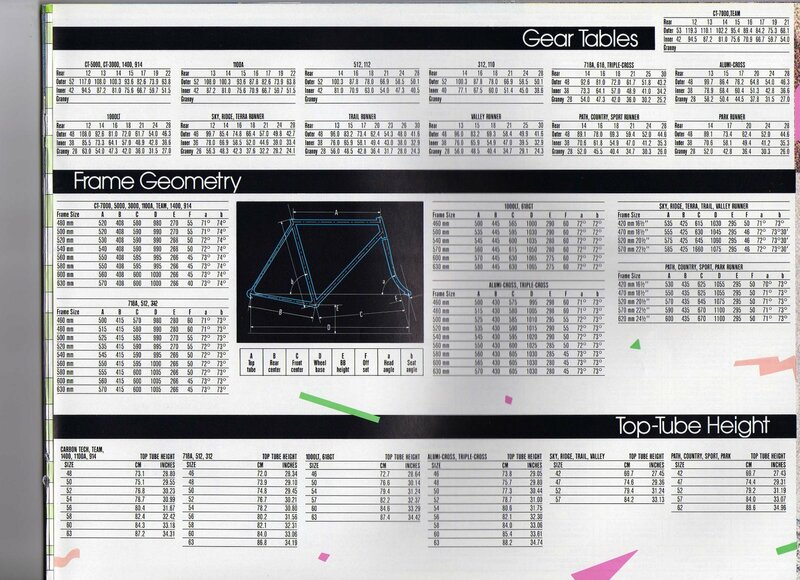 According to the chart- the 54 size (which is the only size I ever pay close attention to) the top tube is 54.5. For the bikes I feel the most comfortable on, the top tube is 55 for a 54 seat tube- so 1 cm longer. I have a Voyageur SP- that is 54 x 54. That can feel cramped compared to my Treks. As I recall as I was evaluating a Miyata 1000- it was something like a 51x51. I don't think I could have done that. And because my bikes are what I know- anything smaller feels short by comparison. PC be damned used to laugh when I saw " PCU " the movie... So true now. I would be pulling parts off other bikes If I was that close to getting a great bike like that back on the road, will power you have ! I'm working long hours but I have my vacation a week from now. I'm really going to make an effort to get it done. I have a few parts around but I'll have to buy wheels and bars. I will be dualy jealous when I see the pics of you and the bike out on wonderful rides. But happy for you ! Some nice Sanshin sealed bearing hubs would really work on that bike!